The Creative Zen Micro caused a stir when it arrived. It looks good and draws comparisons with Apple's Mini. The Micro certainly lives up to its name: it's about the same size as a pack of cards and weighs 108g. The Micro has a pearlescent back and it's available in a range of front colours including white, black, silver and pink. 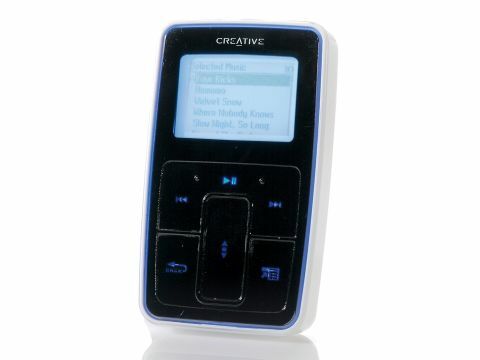 The variety of shades adds to the appeal of the device, and the coloured case is complemented by the glowing blue controls. Whereas the original Zens used a sidemounted scroll wheel to navigate through the menus, the Micro has a front-mounted touch scroll pad. This can be hard to use as it's just too sensitive. Furthermore, as well as controlling up and down it's also the select button. So we'd be trying to go up and down the menu and it would select something and take us further into the menu system instead. As you can imagine, this becomes annoying after just a few minutes, even when you lower the sensitivity. It's the same with the other touch-sensitive control on the front for play/pause, forward and reverse. It took us a few goes before it would pause, which isn't good. In terms of functionality the Micro doesn't have much more than the bigger Zen Xtras. It does have an FM radio and a voice recorder option, both of which work well. The microphone is particularly good.